We are in Transylvania; and Transylvania is not England. Our ways are not your ways. And there shall be to you many strange things. 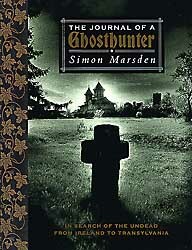 During the course of a year-long journey among the 'undead', which began in the wild Celtic landscape of southern Ireland and went through the British Isles, France and Germany to the untamed mountains of Dracula's Transylvania, Simon Marsden sought out and photographed some of Europe's most haunted locations. His startlingly atmospheric black and white photographs are here beautifully reproduced alongside his own chilling prose. From the bizarre to the simply terrifying, the stories feature a collection of ghosts, ghouls, vampires and other evil creatures of the night. A powerful and enduring belief in the afterlife has been a feature of all the great civilisations of our world since the beginning of recorded time, and tales of ghosts and other strange apparitions are everywhere to be found at the crumbling edges of rationality. The Journal of a Ghosthunter reveals a hidden world where lost souls still roam the fantastic ruins of castles and palaces. Here the perpetual world of the supernatural, from its noblest to its darkest manifestations, is eerily portrayed in Marsden's poetic, gothic style. A classic volume, a unique addition to the chronicles of ghost-lore. London by Little, Brown & Company, October 1994. New York by Abbeville Press, September 1994. Germany by Eulen Verlag, November 1994. Paris by Editions Abbeville, October 1995. Japan by Treville & Company, May 1996. This book is no longer available/out of print.